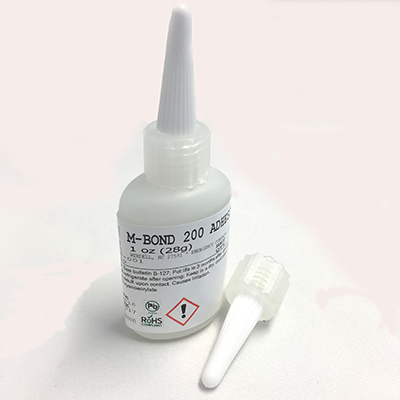 M-Bond 200 is a cyanoacrylate that has been pretested and certified for use in bonding strain gages. It is an excellent general-purpose adhesive for laboratory and short-term field applications. The procedure for making a strain gage installation with M-Bond 200 is illustrated and described in detail in Instruction Bulletin B-127 included in each kit of adhesive. The user should note that the performance of the adhesive can be degraded by the effects of time, humidity conditions, elevated temperature, and moisture absorption. Because of the latter effect, strain gage installations should always be covered with a suitable protective coating.